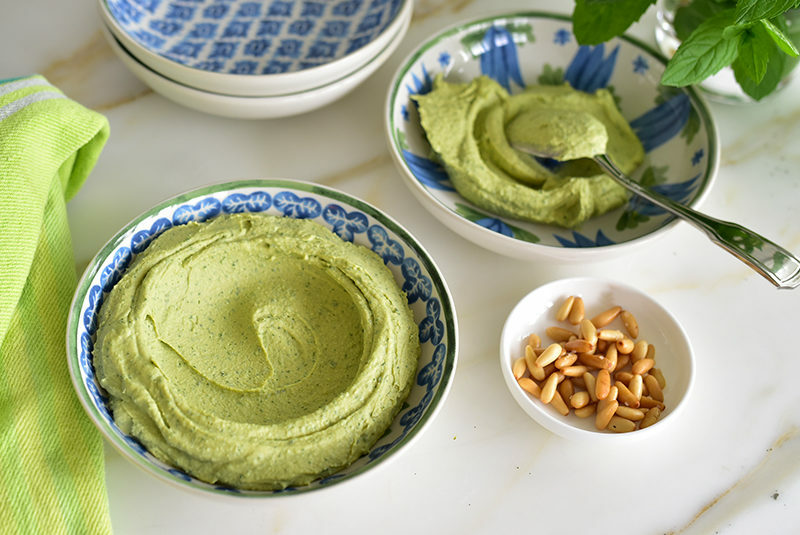 Fresh Mint Hummus is so fresh and flavorful, we may not ever eat hummus any other way…. 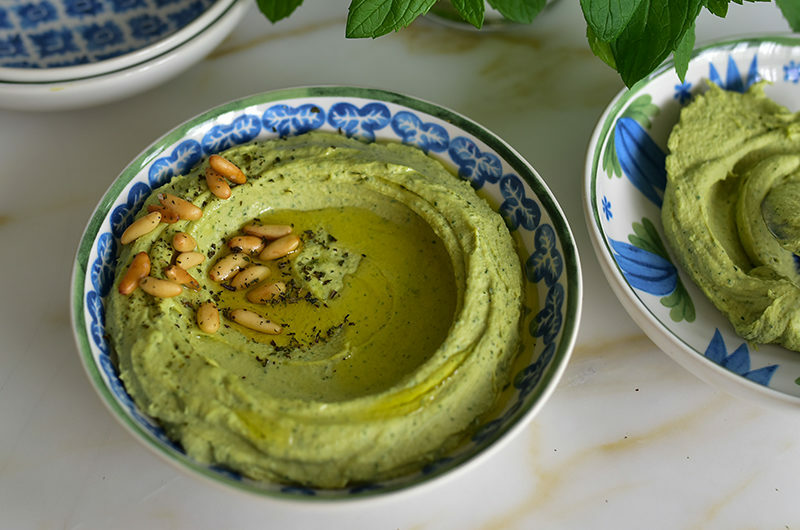 Use the same simple hummus ingredients of skinless chickpeas, garlic, lemon juice, and tahini with a big handful of fresh mint and basil for a hummus that tastes as beautiful as it looks. Finish fresh mint hummus with an excellent olive oil, like Infused Mint Oil from Maureen Abood Market (where you’ll also find the Smooth Hummus Kit, exceptional tahini, Mint Salts, and much more!). Could we talk about the weather? I don’t know about you, but here: that was one looooooong cold snowy cold icy cold winter. The worst of it wasn’t even that we had ice and snow in early May. The worst of it was the gray. Hey, I’m as big a fan of greige as you are, but that’s limited to interior design and has not one thing to do with the weather. Also, cozy rainy day is a very close friend of mine. We get along perfectly. Book, soft lamp, cup of Lebanese cafe blanc + snack. Total silence other than rain on the roof. Nice to see you again, my Introverted Self. Love you. So, I can appreciate the occasional inclement weather. But the day after day upon day of gray? I don’t even know that I myself understood the extent to which I was color-deprived these months, until we came out of it. The spring color here, however late it came, has been feeding my soul in the deepest way. Every time I step outside it’s as though I’m quaffing of a rare fine wine (the deep breath, the nose right into it). The light and color have been feeding my body too, in my own version of photosynthesis. 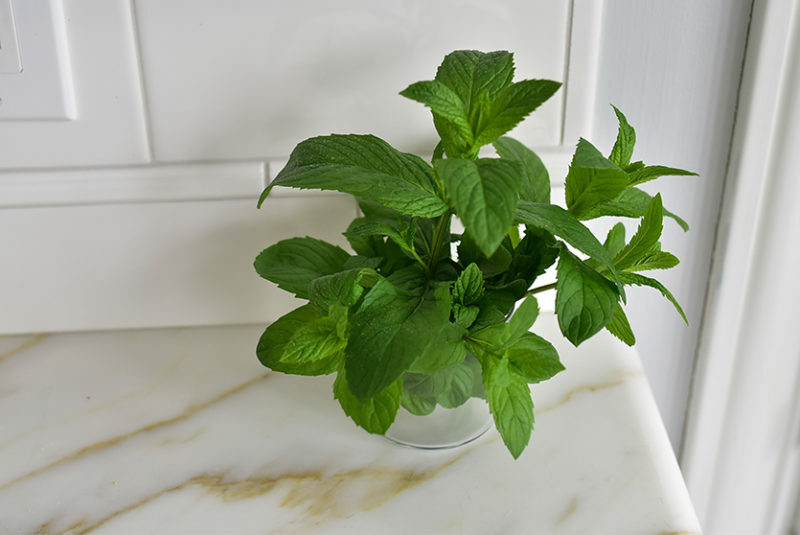 When I first saw the mint shooting up out of a pile of old, dry leaves in a corner by the house, I had zero restraint to let them grow and I picked right away. Must have been a good thing, or it’s just mint being mint and growing with complete abandon, but the mint went crazy out there. I’m like a lenient mother now, letting the mint come up wherever it pleases, in any and every nook and cranny it wants. I’m mint-ravenous, mint-greedy, mint-starved. That’s just being Lebanese, right? I want the mint, and every herb I can get my hands on, in most everything I make. 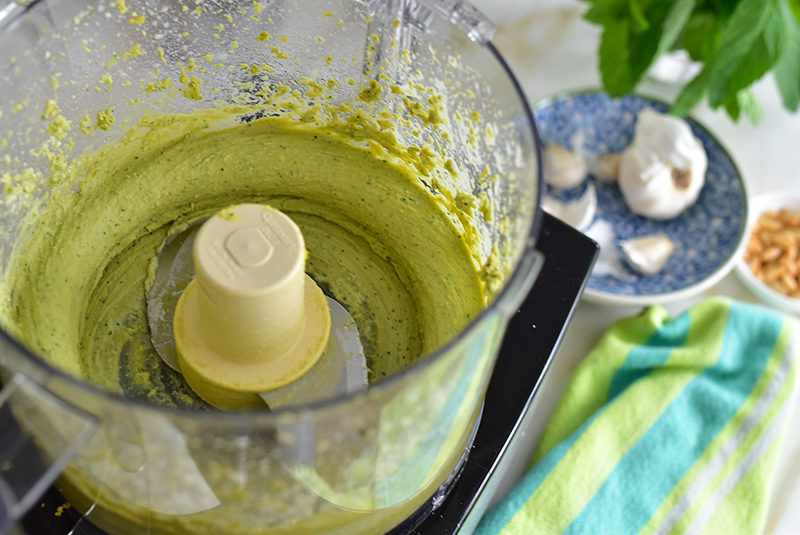 Enter Fresh Mint Hummus. Such flavor! Such color! I almost feel guilty that the hummus purist in me is betraying the hummus rules: skinless chickpeas, garlic, salt, tahini, lemon. Period. But no. It’s not like I’m replacing the chickpeas with cannellini beans and calling it hummus. I’m adding an aromatic that elevates the experience. This is spa-like effect, and we’re all leaving a little more renewed . . . breathing easier . . . flush with color. 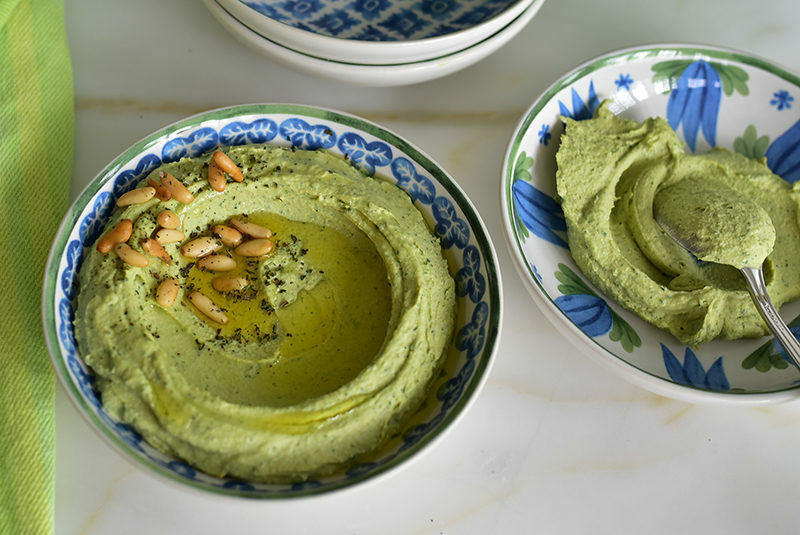 The variation of herbs in the hummus is flexible—I like mostly mint, but I always add some basil to bring up the green color more, and it tastes great. But the skinless chickpeas are not flexible! Buy your chickpeas already skinned from Maureen Abood Market, or add 1 ½ teaspoons baking soda to drained canned chickpeas and heat them in a saute pan. Then immerse the chickpeas in a huge bowl of warm water and rub them til the skins fall off, draining and rubbing several times until every skin is gone. This recipe expands with ease. Finish the hummus with Infused Mint Oil or other excellent olive oil. 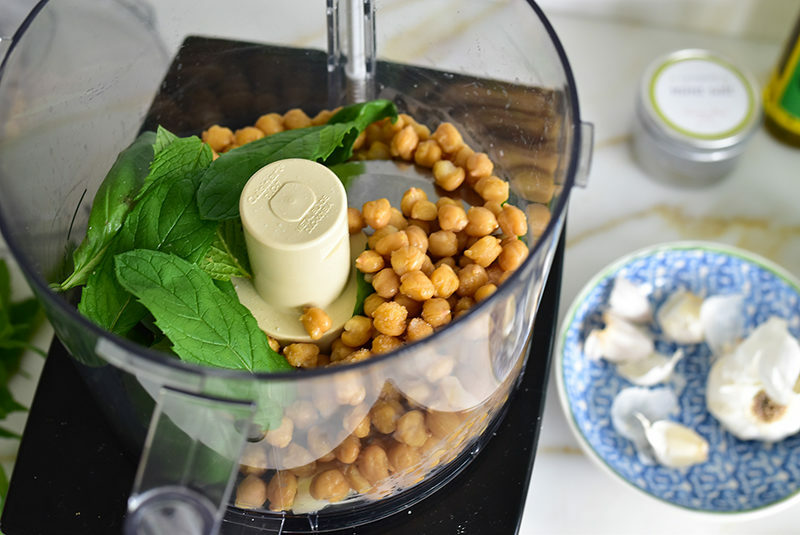 In the food processor, blitz the chickpeas, garlic, salt, mint and basil until extremely well pulverized, a good 5 minutes, stopping to scrape down the bowl a few times. 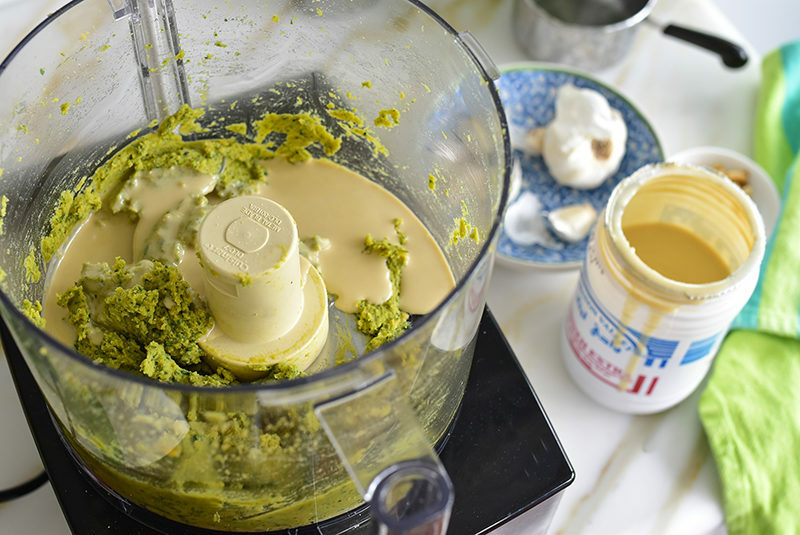 Add the tahini and process until well blended, then add the lemon juice and process again. Taste the hummus; add water if the hummus is too thick, and add more salt if needed. Spoon the hummus onto one or two small plates. Use the back of a clean spoon to create a well in the center of the hummus. Drizzle with olive oil and sprinkle with pine nuts and dried mint.